Construction delays and big holiday crowds mean you’ll have to add extra time to fly in or out of the D.C. region's airports for much of the next month and a half. ARLINGTON, Va. — Construction delays and big holiday crowds mean you’ll have to add extra time to fly in or out of the D.C. region’s airports for much of the next month and a half. The key is to plan ahead and come early, said Margaret McKeough, Metropolitan Washington Airports Authority executive vice president. At Reagan National and Dulles International airports, operated by the authority, there are going to be about 1.3 million passengers just over the 10 days surrounding next week’s Thanksgiving holiday. The busiest Thanksgiving travel times are this Friday through Wednesday, followed by Sunday and Monday. The Monday after Thanksgiving, Metro shuts down the Yellow Line for two weeks, which could complicate travel further at Reagan National. Unlike last Friday though, the Metro station will remain open with only Blue Line service. That shutdown and ongoing construction at the airport on a rainy getaway day last Friday created major traffic problems. McKeough promises an “ever-present” focus on preventing traffic from being as horrendous as it could be this holiday season. 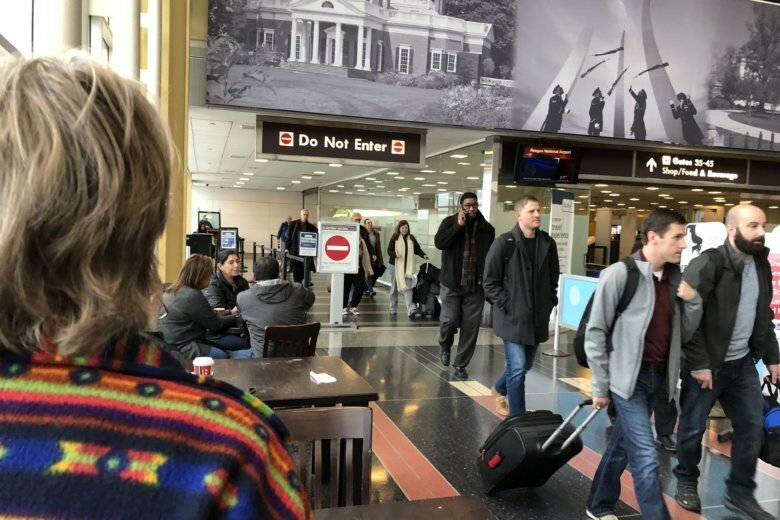 At BWI Marshall Airport, operated by Maryland, traffic changes for the holiday season include eliminating a number of bus stops the next few weeks to consolidate commuter and Metrobus service to single areas outside the terminal. Nationwide, the Transportation Security Administration expects a busier holiday air travel season this year than last. Many airlines are sending travel and traffic advisory emails to passengers, and the airports hope many will come early to shop and eat. As the holiday travel increase starts Thursday, the Airports Authority is deploying more traffic control officers, promoting the free parking for up to 60 minutes in Reagan National garages during the construction project there, and launching a new Uber and Lyft option to choose between getting picked up on the lower baggage claim level or the upper arrivals level. “The more seasoned travelers or the travelers that don’t have a lot of baggage will know that it’s a lot easier to go upstairs than to stay downstairs on the arrivals level,” said Richard Golinowski, Project Journey Integration Manager. Lyft is also now adding a feature similar to one used by Uber to match riders with drivers just dropping off people at the airport, which could help cut down on the number of cars looping around. Project Journey is what Reagan National is calling the major construction projects causing significant lane closures at the airport through the end of next year. New security checkpoint areas are being built over the lower roadway outside Terminal B/C and a new concourse for small planes is being built to replace Gate 35X. Issues getting those construction lane closures reflected in traffic apps are just some of the things to watch out for. “Waze has updated their maps in their system to highlight where the traffic pinch points are on the airport … there was an issue early on where the Waze map was actually sending you down on the airfield somehow, and we actually had several drivers that were going down by our south [hangar line]. No, they didn’t get there,” Golinowski said. In addition to the 60 minutes of free parking in Reagan National garages for pickup or drop off, the Airports Authority is trying to fill those spots with drivers who would usually use economy lots for long trips. With a promo code, discount and advance reservation, Reagan National parking garages will be 30 percent off for stays of four days or longer. At Dulles, the discount will cut the price from $17 to $12 per day with a coupon. At Reagan National, the cellphone lot is now available again for the Airports Authority to open if needed over the Thanksgiving holiday, but they will only do that if absolutely necessary, since they feel pushing people into the garage is more beneficial for traffic.